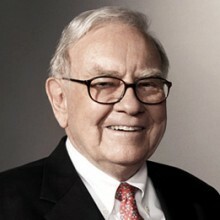 Warren Buffet is the chairman, CEO and the largest shareholder of Berkshire Hathaway, a multinational conglomerate holding company headquartered in Omaha. He is much respected by his peers and the world alike for his personal frugality and adherence to ethical principles when it comes to successful business management. Called the ‘Oracle of Omaha’, Buffett rose from a modest beginning to become one of the richest men on earth through his sheer hard work and keen sense of investing. He started demonstrating his financial abilities from his early years when he would go from door to door selling candies and soft drinks. He began investing as a teenager and had saved almost $10,000 dollars by the age of 20. He had great business acumen and started out on his career as a stock broker. He developed his own investment principles which helped him acquire a lot of wealth; he was already a millionaire by the time he was in his early thirties. As his wealth grew, so did his desire to give back to the society—he is a notable philanthropist and has pledged to give away a significant portion of his fortunes to charity.